KOLKATA POLICE RECRUITMENT NOTIFICATION 2018 Hello everyone we are back with a new recruitment notification, with KOLKATA POLICE RECRUITMENT NOTIFICATION 2018 then here is an opportunity for you. An organization has issued a fresh notification for KOLKATA POLICE Recruitment Notification 2018 has invited applications through an mode so guys if you are interested in this job alert then visit. Educational qualification– Candidate who has successfully completed GNM Course/ B.Sc (Nursing)/ MBBS in from any recognized an institution or boards are eligible to apply these vacancies. Age criteria– Candidates upper age limit should not exceed 50 Years. Age relaxations will be applicable as per the rules. For further post wise age detail go to important links given below. Scale Of Pay – Rs. 40,000/- (Post 1), Rs. 21,000/- (Post 2), Rs. 18,000/- (Post 3) Per month. Selection Process– All form submitted Candidates will Be Selected through Based on Their Performance in Merit List, Interview. Important Dates – Desirable Candidates are advised to apply through Walkin Interview mode as soon as before 26-November-2018. Address – Kolkata Police Hospital, 2, Beninandan Street, Kolkata – 700025. How to Apply– All candidate & interested are advised to submit their form through offline mode and also send it with all required documents (Mentioned In Detailed Advertisement) to the following address. Also must read the official advertisement in detail before applying. Educational qualification– Candidate who has successfully completed 12th in PCB and Diploma in Medical Technology / Post Graduation in respective discipline/ MBBS Degree/ B.Sc Nursing/ General Nursing & Midwifery in from any recognized an institution or boards are eligible to apply these vacancies. Age criteria– Candidates age limit should not exceed 60 Years (specialist doctors), 50 Years (other posts) As on 01-01-2018. Age relaxations will be applicable as per the rules. For further post wise age detail go to important links given below. Scale Of Pay – Rs. 50,000/- (Post 1), Rs. 40,000/- (Post 2), Rs. 21,000/- (Post 3), Rs. 18,000/- (Post 4,5). Selection Process– All form submitted Candidates will Be Selected through Based on Their Performance in Academic Records, Merit List, Experience, Interview. Important Dates – Desirable Candidates are advised to apply through Walkin Interview mode as soon as before 25-July-2018. Educational qualification– Candidate who has successfully completed 8th in from any recognized an institution or boards are eligible to apply these vacancies. Age criteria– Candidates age should be between 20 to 60 Years As on 01-01-2018. Age relaxations will be applicable as per the rules. For further post wise age detail go to important links given below. Selection Process– All form submitted Candidates will Be Selected through Based on Their Performance in interview. Important Dates – Desirable Candidates are advised to apply through Offline mode as soon as before 16-July-2018. Age criteria– Candidates upper age should be between 20 to 60 Years as on 01-01-2019 is age limit for these posts and candidates who are from reserved category will get age relaxation on an upper age limit as per state government rules and regulations. Pay Scale– After completion of selection rounds, those who will be selected for a job will get a pay Scale detail go to important links given below. Important Dates – Desirable Candidates are advised to apply through Offline mode as soon as before 05-JUN-2018. Age criteria– Candidates upper age should be between 20 to 60 Years as on 01-01-2018 is age limit for these posts and candidates who are from reserved category will get age relaxation on an upper age limit as per state government rules and regulations. Important Dates – Desirable Candidates are advised to apply through Offline mode as soon as before 13-March-2018. Important Dates – Desirable Candidates are advised to apply through Offline mode as soon as before 25-January-2018. Educational qualification– Candidate who has successfully completed 8th Class in from any recognized an institution or boards are eligible to apply these vacancies. Age criteria– Candidates upper age limit 20 to 60 Years As on 01-09-2017 is age limit for these posts and candidates who are from reserved category will get age relaxation on an upper age limit as per state government rules and regulations. Important Dates – Desirable Candidates are advised to apply through Offline mode as soon as before 06-11-2017. Address –Traffic Training School, 8, Tarashankar Sarani, Kolkata 700 037. Educational qualification– Candidate who has successfully completed 08th in from any recognized an institution or boards are eligible to apply these vacancies. Important Dates – Desirable Candidates are advised to Apply Offline mode as soon as before 07-09-2017. Address – Government of West Bengal Office of The commissioner of Police, Kolkata 18, Lalbazar street, kolkata – 700 001. How to Apply– All candidate & interested are advised to submit their form through offline mode and also send it with all required documents (Mentioned In Detailed Advertisement) to the following address.Also must read the official advertisement in detail before applying. Age criteria– Candidates upper age limit 21 to 40 Years As on 01-01-2017 is age limit for these posts and candidates who are from reserved category will get age relaxation on an upper age limit as per state government rules and regulations. Pay Scale– After completion of selection rounds, those who will be selected for a job will get a pay Scale Rs. 11,500/- from department. Selection Process– All form submitted Candidates will Be Selected through Based on Their Performance in Driving Test, Interview, Medical Exam. 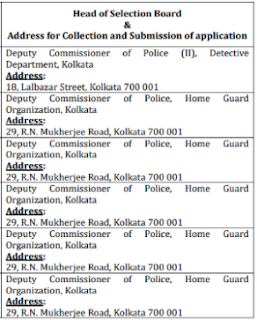 Address – To The Chairman, Interview Board for Contractual Driver in Kolkata Police, Zone.